High-flying engineering apprentice Katey Ikin has graduated from Cygnet Texkimp’s three-year apprenticeship scheme to become a fully-qualified electrical engineer. Katey’s practical and written work also came in for special praise from tutor Neil Ahern at work-based training provider Total People, which works in partnership with Cygnet Texkimp to deliver its apprenticeship scheme. 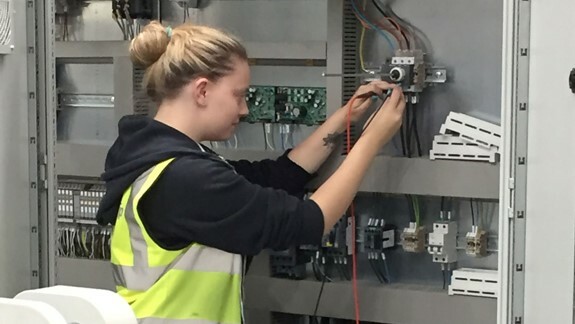 Katey decided she wanted to become an engineer as a young girl and went on to study electrical engineering at GCSE and BTEC level before joining Cygnet Texkimp to complete her HNC as part of her apprenticeship. “I’d really love to inspire other young women into engineering and hope to get involved in a school mentoring programme,” says Katey who also regularly works as a volunteer with young people at the Moulton Adventure Group in Cheshire. Contact us here for more information on our apprenticeship scheme.